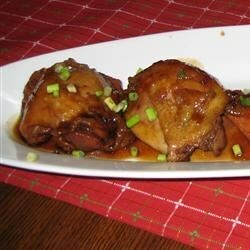 "If desired serve with rice or noodles, pouring sauce from chicken over each serving. You can also cut down on calories by not dredging the chicken but just browning it in a roast pan (using cooking spray) on top of the stove, then adding the remaining ingredients as directed and roasting in the oven. It's good either way!" Preheat oven to 350 degrees F(175 degrees C). Dredge chicken wings in flour and brown slowly in butter or margarine over medium heat. Place browned chicken in a 9x13 inch baking dish. Add the onion, orange juice, ketchup, brown sugar, soy sauce, ground ginger and garlic powder/salt to the frying pan. Bring to a boil. Pour mixture over chicken and bake in preheated oven for 30 minutes. Turn chicken and continue baking for 30 additional minutes or until very tender. Very good recipe using chicken wings. The meat nearly fell off the bone - very tender. Nice change of pace instead of plain old baked chicken! The wings were too fatty to enjoy. Very bland - did not like!